Thank you to Glendenning Farms for your purchase of this beautiful heifer at the Hudson-Valentine Sale in Fort Worth, Texas for 10000.00. She is a beauty. 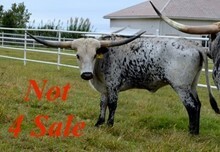 Consigned to the Hudson-Valentine Sale in Fort Worth, Texas on 9/14/18. Beautiful Saddlehorn daughter out of a big horned Top Caliber daughter.